Hello there, sorry I haven't posted anything in so long, my husband and I are on a much needed vacation! I'll be back home in a couple weeks, but I'll make sure to post some fun Hawaii/Pennsylvania pics soon! I was supposed to post this card yesterday and time got away from me! The Monday girls made cards for kids today! I just got this super cute stamp set, The Botz Family by Our Craft Lounge, and knew it would make a perfect kids bday card! Isn't that robot adorable? There are three really cute ones but I love this one holding a teddy bear! I used one of Julee's Verve Release Party sketches for the layout. I colored the ribbon in with Copics and then doodled a little around the frame. Just in case you wonder where I am for the next few days, I'm on vacation! That's right, the hubby and I are off for the next three glorious weeks! We're off to visit my family in Hawaii, and then off to PA to visit his family and then back to Hawaii for awhile and then back home:) It's going to be SO FUN! The only hard part is that we're hopping, we don't have commercial plane tickets? What does this mean in laymen's terms? Well a hop is basically hitching a ride on a military plane (no, not a cool fighter jet, lol!) that's on some kind of mission and has a few seats to offer military personnel who want to travel a bit. The PRO is that it's absolutely FREE and you can go basically anywhere in the world you want to go, but the CON is that it's not really reliable as far as when you want to leave. It's kinda like a first come first served deal, but not quite. There are 4 categories, and depending on when you signed up, you could be first on the list or you could be 3,458th. We were 50 yesterday so hopefully we moved up the list today, lol! We were supposed to catch a hop this morning *as in 3:30 in the morning* so we got a couple hours sleep, then woke up at midnight to get to the terminal and wait for our name to be called. Well on this particular plane, going straight to Hawaii, there were 12 available seats. We were scared cause there were about 30 people in there waiting to get on the plane. Well we lucked out and got seats! So we're going through security, getting boarding passes, checking in our bags when the aircrew announces that they only have enough weight allowance for SIX passengers instead of TWELVE so we got bumped off that flight. We went back home, got a couple more hours of sleep and then showed up to try and get on the the 0900 flight. Well we get to the terminal and find out that the flight is delayed cause something is wrong with the plane. So we'll try again tonite, wish us luck! I'm getting super tired of being turned away, lol! Pulling all my suitcases all over the place for nothing is NOT my idea of vacation! LOL! I've created a few cards to share over the next few days, plus I'll be sharing pics of our vacation (Hawaii, can't wait!) Enjoy your day, see ya later!!!!!!! 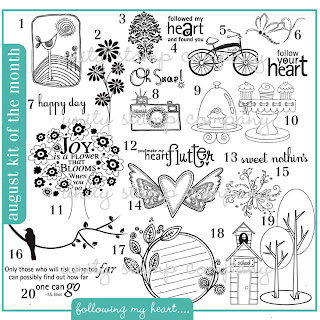 Don't forget that if you order your August KOM this month ONLY, you will receive Sending My Love for FREEEEE!!! Today has been long and exhausting so I'm keepin this lil post short! 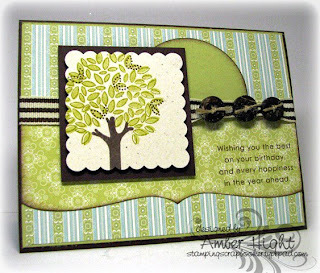 The monday girls decided that we should make cards featuring TREES today! No problemo, I'm IN TO trees, especially this beautiful tree from the August 09 KOM by Unity! 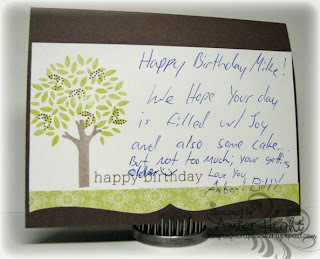 I stamped the polka dot background on a piece of Rich Razzleberry and heat embossed it. The dp is by making memories! Today also marks the beginning of the Anni-VERVE-sary release! There will be games, challenges, and prizes ALL WEEK LONG in the Verve forums, so come hang out! 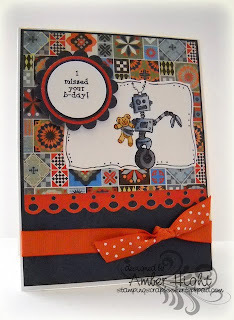 I pulled out some of my favorite old Papertrey Ink stamp sets for this one! 3-Cut piece of dp from Everyday Blessing pack by PTI to another 1/8" shorter and adhere to Spring Moss piece. 4-Cut piece of dp from Everyday Blessing pack by PTI to 2x5.25 and cut with Spellbinders Piercabilities. 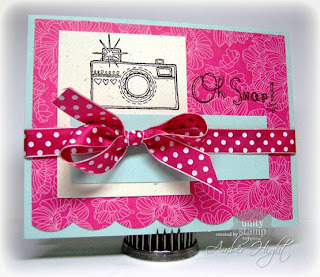 5-Stamp sentiment from Birthday Basics on dp. 6-adhere ribbon (from MM pack) and add 3 Rustic Wood buttons by PTI, tied with Jute string. 8-Mount scalloped quare on dimensionals onto a slightly larger piece of chocolate chip cardstock. 9-Add Spring Moss circle behind the square and adhere everything down! Would you like to see why you shouldn't let your husband write on the inside of your c herished artwork? It's a BRAND NEW MONTH! And that brings a BRAND NEW KOM by Unity! 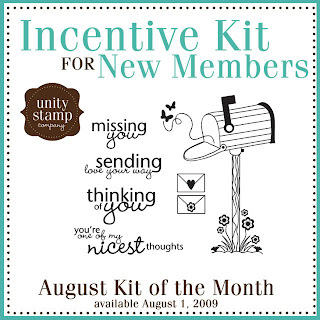 If you sign up for the kit this month, not only do you get the KOM, but you also get this incentive kit for FREE! To quote Jen-E..."SHUT UP! It's TRUE!" I adore that mailbox and the little butterflies! Can't wait till it's mine! If you have been getting your KOM's the past couple months, and have always wanted to be a Unity Designer, now is your chance! The September guest dt member spot is once again up for grabs! All you have to do is go to THIS thread and create a card with the guidelines posted. All entries are due to be uploaded to SCS (keyword USGDC04) by 5 pm CENTRAL on 10 August. The winner will NOT BE CHOSEN RANDOMLY! The DT votes on the projects that are submitted so lets see what you've got! The challenge this month is a 1-2-3 challenge! **My two patterned papers are Friends til the End and Bitty Dots, both by PTI. 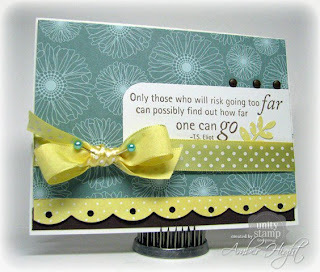 **My three embellishments are the Lemon Tart ribbon by PTI, Brads by Bazzill, and the scallop edge die by Spellbinders! **I can't wait to start crusing the gallery for your entries! Don't forget to check out THIS thread for ALL THE DEETS! 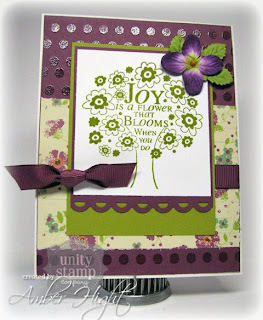 This first card uses the sentiment from Sweet on You and the flowers are from Floral Whimsy. 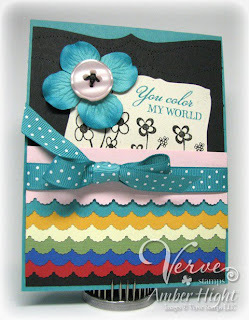 This card is also my submission for today's Inspiration Challenge on SCS! I had so much fun crusing the Heavenly Hostess website! I saw THIS image and was instantly inspired by the bright colors! Here's my first card! How would you like a sneaky peak of a NEW SET coming out THIS MONTH??? I bet you'd LOVE a peak! ;) All along the hop today, Diva's will be sharing some new peaks so make sure you get ALL the way through the hop to see every sneaky peak you can! 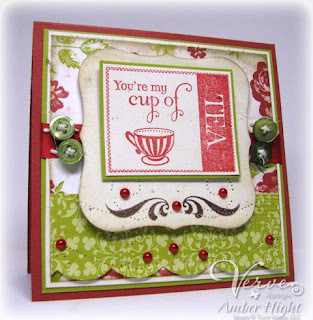 Here's a quick peak at a new set called "A Cup of Life"
Well, you have LOTS of fabby blogs to hop through, so I'm going to quit chatting and send you on to ANJOU!!! If you're just happening upon my blog and are interested in all the Vervy-goodness that today has to offer, start out at the Verve Blog and hop on through! Enjoy the blog hop!